Arm wrestling is often used as a trial of strength, which is meant to ‘prove’ how strong you are. However, while physical strength does matter, most people have no idea how to utilize it effectively, especially in this context. This means that by making a few simple modifications to your technique, you should easily be able to win at arm wrestling, even when fighting against a stronger opponent. In the following article, you will learn about some basic guidelines and techniques that you can use in order to gain a significant advantage in arm wrestling and reduce the risk of being injured. Note that the more of these tips you follow, the greater your advantage will be. However, even following just a few of them can be highly beneficial, especially in terms of protecting yourself from injury. Most people mistakenly believe that arm wrestling is just about applying side pressure to the other person’s arm, and trying to push it downwards. In reality however, proper arm wrestling technique involves a significant pulling motion, which isolates your opponent’s arm, and places it in a position where you can easily pin it. Essentially, what you are trying to do is make a strong pulling motion, using your back and shoulders in addition to your arm, in order to get your opponent’s arm close to you and away from their body. Then, rotate your shoulder and body in the direction that you want your opponent’s arm to go, and apply downward pressure in order to finish them. Stand so that your forward leg is on the same side as your competing hand. For example, if you’re competing with your right arm, then you should stand with your right foot forward. Stand with your hip close to the table, so that your arm is near your body. This will help you use your whole body when making the pulling motion, rather than just your arm. Once the contest is about to start, engage your core muscles and keep them ‘tight’. Doing this will help with the pulling motion, and will give you a minor boost in strength. Try to get your hand into a toproll position. This involves rotating your hand over your opponent’s, so that your forearm is in prone position, while simultaneously twisting your wrist towards your own body. You can sort of ‘climb’ with your hand over your opponent’s hand by loosening your hold a bit, and then moving your fingers forward and gripping tightly again once you’ve advanced. To help strengthen your grip, you can curl your thumb and try to get it underneath your own fingers. Make sure to keep a tight grip throughout the match, but don’t overdo it so much that you tire out your hand. Your goal is to keep your muscles engaged and in control, but not to try and crush your opponent’s hand. If you and your opponent are closely matched in terms of strength and technique, then the winner could simply be the one who refuses to give up, which a lot of people do prematurely when they think that they’re about to lose, even if that’s not the case. As such, as long as you still have strength left, try to hang on, and keep the match going. Remember that if you’re feeling tired, your opponent is likely feeling the same. 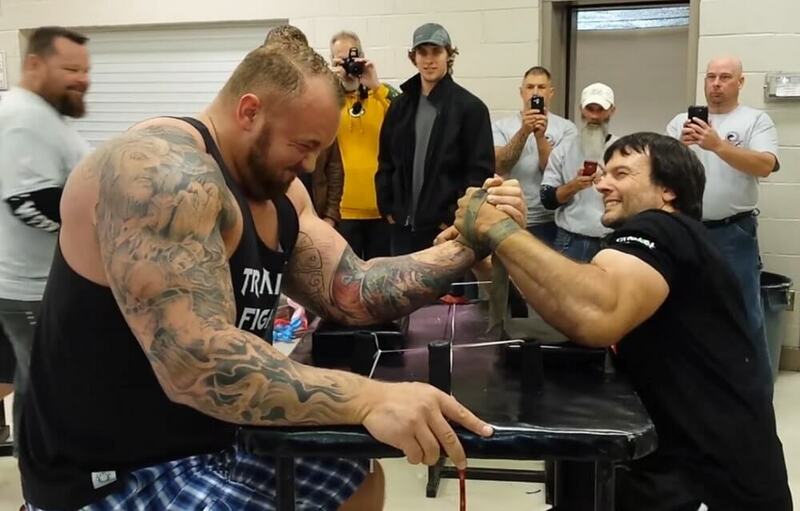 This is where mind games come into play in arm wrestling. Essentially, you want to appear as confident as possible, even if you don’t feel confident in reality. Your opponent likely won’t know how tired you are, but will probably assume that you can easily tell how tired they are. This occurs due to a cognitive bias which is known as the illusion of transparency, that causes people to think that their feelings are more obvious to others than they are in reality. Overall, remember that feeling and looking confident can play a huge role in beating your opponent. At the same time, you should also hang on, and not give up prematurely, before you’ve actually been defeated. Strength does matter in arm wrestling, and when there is a big enough difference in terms of strength, no amount of technique could help you win. To take an extreme example, a professional adult bodybuilder is going to beat a 5-year-old kid at arm wrestling, no matter how good the kid’s technique is. However, most situations won’t be as extreme as this one, and in most cases, the difference in strength between you and your opponent should be one that you can overcome by properly using the technical tips that you saw above. 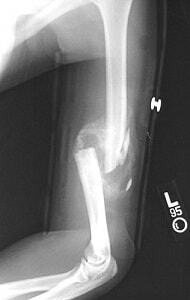 Unfortunately, like other sports, arm wrestling can lead to all sorts of injuries. The most common arm wrestling injury involves a humeral fracture, which essentially means that the bone in your upper arm snaps in half; you can see what that looks like in the picture below. The obvious and most effective way to avoid the risk of this happening is to not arm wrestle in the first place. However, if you do choose to arm wrestle with someone, you can reduce the risk of injury by avoiding the ‘break arm’ position. To avoid this position, you need to keep your arm in line with your shoulder, and perpendicular to your chest. This means that you should be able to look directly at your hand as it moves during the match. In the picture below, the person on the left is in the dangerous break arm position, since his arm is rotated behind his shoulder, and is parallel to his chest, which is facing forward. Conversely, the person on the right is at the appropriate position, since his arm in line with his shoulder and perpendicular to his chest, which minimizes the risk of injury. Accordingly, you can see that the person on the right (who is maintaining a good position) is looking straight at his hand, while the person on the left (who is at the dangerous break arm position) cannot maintain direct eye contact with his hand. Maintaining the appropriate position is so important to protecting yourself from injury, that in some professional matches, the referee might stop the match if one of the contestants strays too far from this position, and gets too close to the break arm position. Strength is important in arm wrestling, but using proper technique can make a huge difference, and allow you to beat an opponent who is significantly stronger than you. In terms of technique, the main thing you should focus on during the match is on making a pulling motion using your arm, shoulder, and back, in order to get your opponent’s hand away from his body in order to isolate it. Once their arm is sufficiently isolated and you’ve gained enough leverage, you can apply downward pressure on their hand in order to finish the match. In terms of body position, you want to stand with the same foot forward as the hand that you’re competing with, while keeping your hip close to the table, so that your arm is near your body. In addition, make sure to engage your core muscles and keep them tense throughout the contest. In terms of hand position, try to rotate your hand over your opponent’s hand, while twisting your wrist towards your own body. Make sure to maintain a tight grip throughout the match, but don’t crush your opponent’s hand so hard that you end up tiring out quickly. To reduce the risk of injury while arm wrestling, avoid the ‘break arm’ position by keeping your arm in line with your shoulder and perpendicular to your body. If you’re in a good position, you should be able to look straight ahead at your arm, without twisting your head.